Want to know what makes Fibre Expressions Quilt Shop so great? Read on to learn more about our dedicated owners! Christine started sewing at the age of 16, when she grew too tall to fit into store bought clothing. She later graduated from a two year clothing design course in Calgary in 1985 and sewed mostly clothing, including formal dresses for private clients, while working in different fabric stores in Calgary and Richmond. She also indulged her creative passions by making and selling fabric covered boxes for jewellery, etc. at craft fairs for several years. After moving to Sechelt B.C., Christine developed a love for quilting and acquired a job in a sewing/quilt shop in 1999, where she took many quilting classes and taught classes as well. She made her first quilt, a double-sized hand quilted quilt for her daughter Stephanie. It took her about seven years to complete the quilt, while working on many other projects in between. After 11 years of working for someone else, and her children finished with school, Christine decided it was time to do something for herself! She just couldn't imagine doing any other job than working with fabric. She also noticed that alot of the quilters in the area were going to the big city to shop, which is a ferry ride away. After finding a great location, with space for a large classroom, Christine decided to open her own quilt shop. Fibre Expressions opened their doors on June 6th, 2011 and they've been enthusiastically serving the quilting community ever since! 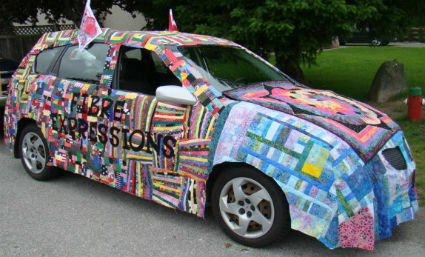 Fibre Expressions has a fitted quilt that completely covers Christines car, which is displayed in local parades, at the annual Show & Shine car event in August, and the "quilted car" is also parked in front of the store on weekends in the summer. Christine quilts the store samples created by Stephanie, and teaches as many classes as she can. Stephanie has been sewing since age 8 when she made a small paper pieced wall hanging for her Dad for Fathers Day. Her passion for sewing was demonstrated in her schoolwork, always being the first one to finish her sewing projects in Textiles class and in the 12th grade she received a Textiles Award. Stephanie and two other staff members stitch most of the samples for the store.